Halloween elite team THE JACKIE FACTORY (Jackie 60, Night of 1000 Stevies) reunite with co-producer EDITRIX ABBY (Click + Drag, Burning Man) for the fifth annual GHOSTLIGHT, a Halloween theatrical and costume party benefitting the HOWL EMERGENCY LIFE PROJECT (HOWL HELP), the East Village wing of THE ACTORS FUND. 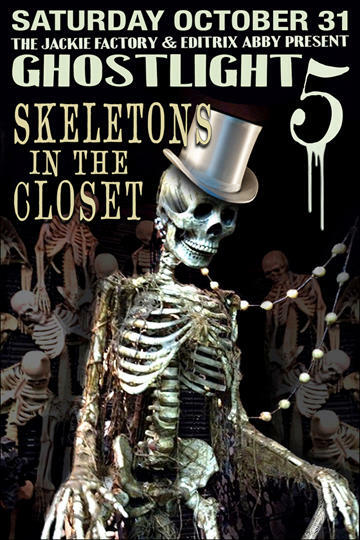 The theme of this year's GHOSTLIGHT is "Skeletons in the Closet" - feel free to interpret it with whatever might be buried in yours! Set in the venerable and haunted GENE FRANKEL THEATRE on Bond Street, the show will once again star East Village performance icons and rising stars from many nightclub dynasties. The 2015 bill includes world burlesque icon DIRTY MARTINI, Blacklips Performance Cult eminence POISON EVE, crooner XAVIER, thesbian goddess HEATHER LITTEER, king of comedy DAVID ILKU (UNITARD), nouveau drag artiste SEVERELY MAME and the costume genius of ART BY DAVEY. We will also feature films in our Secret Cinema - our bill and that program still in formation at press time. GHOSTLIGHT producers CHI CHI VALENTI and EDITRIX ABBY join the golden-throated MC PAUL ALEXANDER as the Mistress/Masters of Ceremonies and our divine DJs are JOHNNY DYNELL, SAMMY JO and ALTHEA LOVELESS. Performances are in two sets at 10:30 and and 12:30 - consult mothernyc.com/ghostlight for complete schedule as we get closer. An annual fundraiser begun in 2011, GHOSTLIGHT celebrates East Village theatrical traditions and nightclub ghosts of the past 150 years. The 2013 and 2014 venue, longtime home of East Village theatrical pioneer, director and acting teacher GENE FRANKEL, is an ideal setting for such a show. Frankel (who died in 2005) definitely haunts the premises, as well as various other apparitions from the Theatre's storied past. Winner of the first OBIE for direction in 1959, Gene Frankel's landmark 1961 production of JEAN GENET's play "THE BLACKS" launched the careers of JAMES EARL JONES, CICELY TYSON, LOUIS GOSSETT JR and MAYA ANGELOU, among others. The 24 BOND STREET building, formerly a hat factory, speakeasy, and avant-garde jazz club in addition to the theatre, also housed the first studio of photographer ROBERT MAPPLETHORPE. SUGGESTED DRESS: Skeleton Gone Clubbing, Haunted Theatrical Glamour (all eras) or Creative Costuming. HOWL HELP was created to provide emergency financial assistance and social service support to artists who have participated in the annual HOWL FESTIVAL or who make their careers in New York City's East Village and Lower East Side arts community. Administered by THE ACTORS FUND, HOWL HELP serves the needs of many artists whose work (of any generation) challenges the traditional boundaries of dance, theatre, music, multimedia and the spoken word. THE JACKIE FACTORY is the NYC based nightclub arts collective founded by husband and wife team CHI CHI VALENTI and JOHNNY DYNELL in 1990. Most famous for the 450 themed editions of its decade-long party JACKIE 60, venue MOTHER, and annual Stevie Nicks extravaganza NIGHT OF A THOUSAND STEVIES, THE FACTORY also creates large-scale spectacles in New York and cities nationwide and worldwide, including LOW LIFE @ HOWL! Fresh from her work at BURNING MAN, EDITRIX ABBY jumps back into NY Nightlife each October with GHOSTLIGHT.